How many times have you driven to a remote location deep in the oilfield, only to find that the directions you were given stop on the last public road? Between you and these wells can lie miles of newly-constructed, unmapped lease roads. Sometimes you can switch to satellite view on your mapping app for help, but on private ranches and leases these images can be outdated, leaving you struggling for a next step. It’s clear that the oilfield needs a way to clearly communicate directions for the “last-mile” – and to convey preferred routes to each vendor and service company. Given the choice between a list of instructions and a map, the vast majority of us prefer the visual aid of having a map to reference – but too often these maps are poorly scaled, imprecise, and sometimes even hand-drawn! 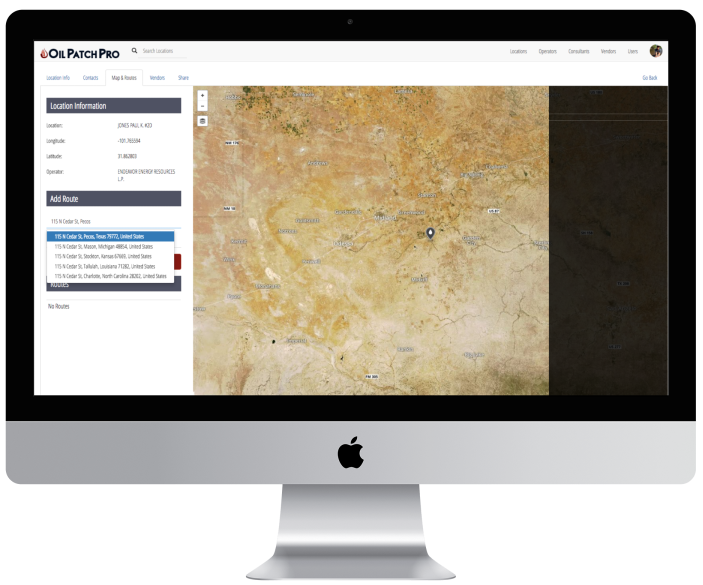 Here at Oil Patch Pro this was a concern we aimed to address for a long time – and we’re proud to announce our solution: “OPP Maps & Routes”. 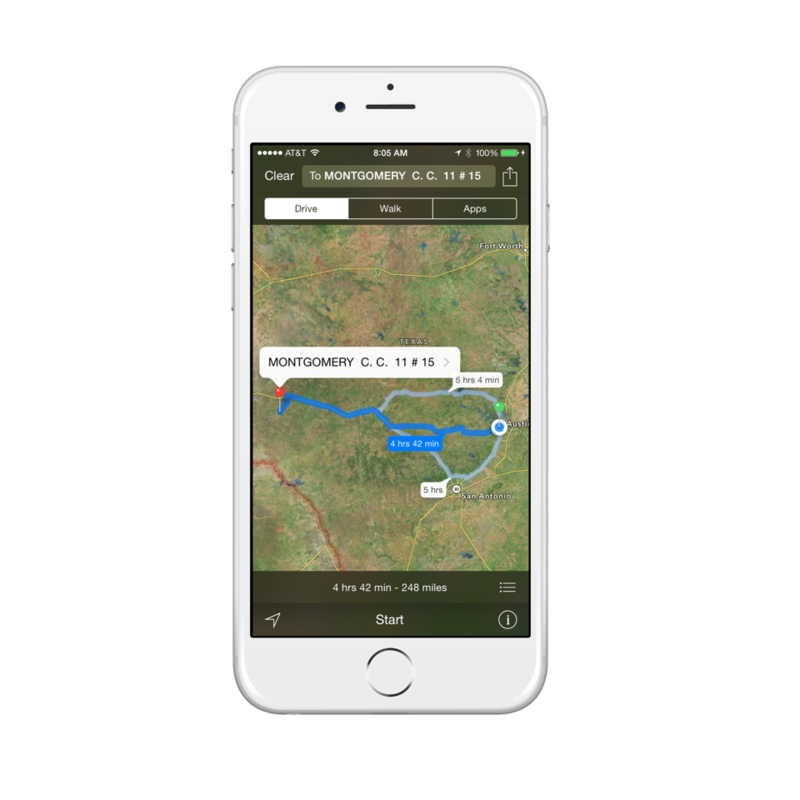 Part of our premium web app, this feature allows operators, vendors, service companies – practically anyone needing to access a field location – to create a custom route from anywhere to the location. With infinitely customizable starting positions, there’s never any confusion! 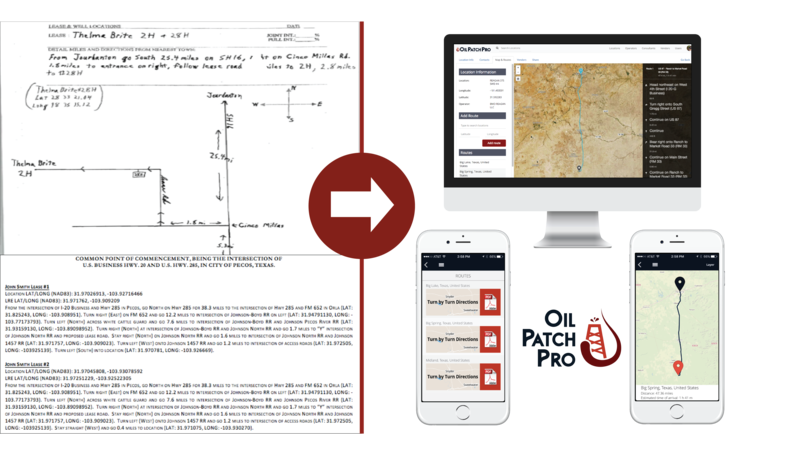 A casing crew from Pecos, TX and a logging truck from Hobbs, NM can both receive customized directions to a well in Garden City, TX complete with both turn-by-turn directions AND a map – all available in our OPP mobile app, or as a PDF download! The best part? It takes less than 5 minutes to set it up. After our feature in the Austin Business Journal last week (click here to read the full story), we got to thinking about the unique niche our app fills in the current economic state of the industry. Let’s not dance around the issue – good news is hard to come by these days. The rig count has recently been increasing, but the news coming out of the major industry players is “lower for longer” – and we still think it’s possible to do some of our best work in this economic climate. Let me explain. Company reorganizations are forcing drillers into operations, and vendors are servicing new locations. While formerly 2 or 3 pumpers may have been servicing a group of wells, now there’s just 1. Those 3 drivers knew their route – but the new driver only knows a few of the wells, how can he find the others? On top of that, how can you expect him to be able to efficiently plan a route to hit each of his stops without backtracking and driving over the same stretch of road multiple times? Make no mistake, rigs (though fewer) are still running – remote areas in the Permian are being developed and new locations are coming online. Despite the downturn, we continue to be optimistic about the value that Oil Patch Pro brings to the entire oil & gas industry. Every week we hear things like “Not sure how i lived without this app” – and that’s all the convincing we need! 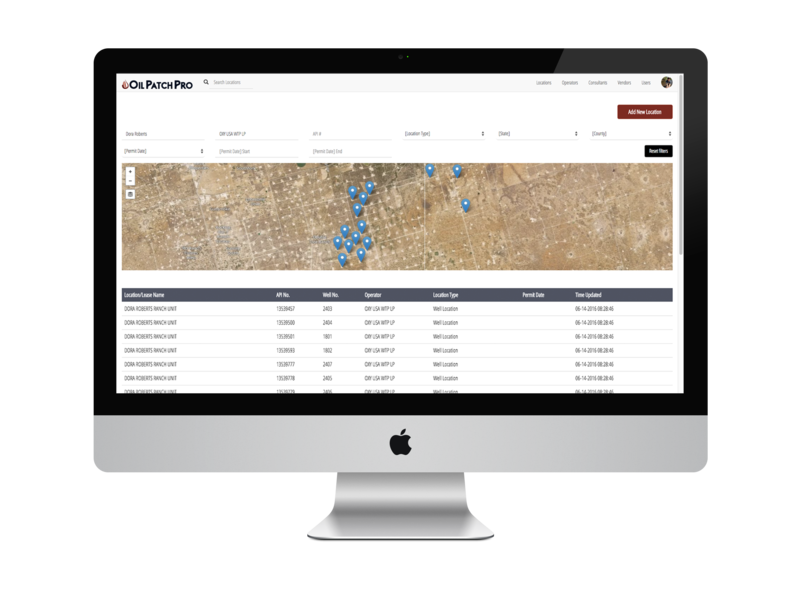 If you’re interested in how Oil Patch Pro can streamline your operations, drop us a line at info@oilpatchpro.com! If you’re reading this, you’re one of the chosen few still playing the game. We didn’t choose this economy, but we know how to make things work in tough times. We can’t change commodity prices (as much as we’d like to), we’ve got to make do with what we’ve got – but what if we could do more every day? What if vendors, field personnel and consultants never got lost and everyone showed up in the right place at the right time? What if giving directions was as simple as tapping someone’s name on your phone? It IS that simple. And we’ve taken it a step further – we can prove you’ll save money using OPP to find locations in the field. First, we started by talking to some industry experts – VPs and Presidents at operating companies, service companies, and consulting firms – we asked them to open their books and tell us how much time they were spending lost looking for a location, tracking down or waiting on directions, or inefficiently navigating the field. Operating companies said this amounted to about 8-15 hours per person, per month – or about 15-30 minutes per day – easily attainable if you’re working new wells every day. For vendors, it was about twice that, or half an hour to 1 hour a day. We all know that you’re better at this if you’ve been around a while, so those “veteran” personnel will get lost less than a green hand – so we chose to assume about a 50% “green” vs “veteran” ratio in the field. Rig standby time is a huge hidden cost, as well – so we assumed that at least an hour of rig standby time would occur each month, and be unaccounted for – a few minutes here or there slips by unnoticed, and rigs can cost thousands per hour – here we assumed about $1500/hr. Let’s say things are slow and we’re only drilling 2 wells per month, with 5 field employees from the operating company and 15 vendor personnel. With an initial investment of under $800 for Oil Patch Pro’s software, we are able to provide $49,950 in increased productivity and cost savings. If we can save a company this much drilling 2 wells per month, imagine the savings we can bring to a large company! Our ROI calculator can determine the exact amount – reach out to us at info@oilpatchpro.com to try it out! Over 2,000 people have used Oil Patch Pro – what’s stopping you? Try it for free on the App Store and Google Play. In the oilfield, you need a reliable truck. Whether you’re carrying tools & rental equipment or towing a boat on the weekend, these rigs will get the job done in comfort! We looked far and wide to bring you what we think are the top 3 trucks 2016 has to offer. We all love the Ford Raptor, but it’s about time there was some friendly competition – enter the Ram 1500 Rebel. It’s imposing inside and out, with a jet black billet grille and a traces of the red interior brought inside. The powertrain is a 5.7L V8 that serves up 395hp and 410 lb-ft of torque, and Toyo off-road tires come standard (so it goes without saying that 4×4 performance is a selling point). We think the coolest part of the Rebel, though, is the air suspension system. 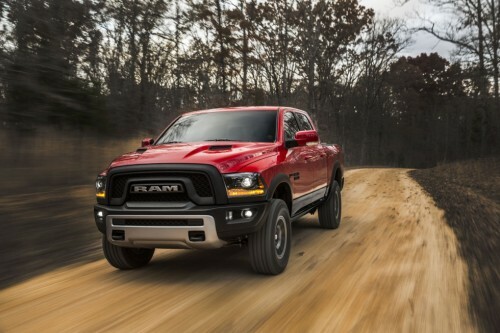 Ram gave the Rebel an extra inch of road clearance, but the system can lowers for highway aerodynamics (increased MPG) and on-demand for easier entry. The rebel only comes as a regular cab or crew cab and is priced around $45k – it can even be customized with the signature Rambox cargo management system – a must-have if you travel with tools! 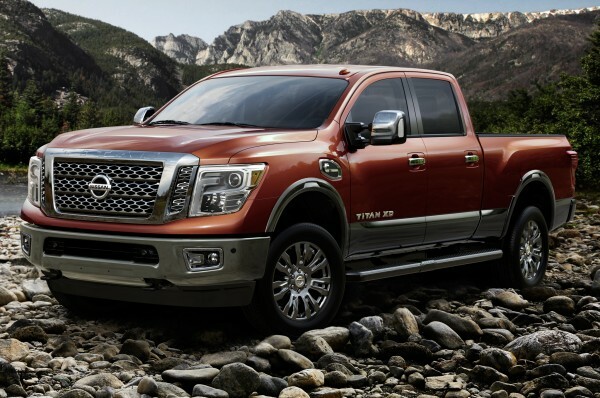 If you’re looking for a truck that boasts brute muscle and size without sacrificing creature comforts, you may find your soulmate in the Nissan Titan XD. This year the Titan’s redesign is immediately apparent in the imposing bodywork and sheer size. The XD is technically a light-duty It’s available only in the XD trim, and with a Cummins 5.0L V8 turbodiesel. This power plant delivers a reasonable 310hp but crushes the competition with 555 lb-ft of torque and a staggering 12,000-lb towing capacity! Long trips to and from the field are comfortable in the Titan, thanks to Nissan’s “Zero-gravity” seats – and the large center console doubles as a much-needed workstation for long days onsite. Like the Ram, it features customizable in-bed storage that’s locking and drainable – so it can be used for storage or even as a cooler! The quintessential pickup returns in 2016 with a ground-up redesign that’s not merely surface-level. The engineers at Ford have used the same technique that they pioneered for Jaguar and Land Rover (before those brands were sold) of laying aluminum body panels over a steel chassis, and brought it to this industry-benchmark of a truck. The new bodywork isn’t just weight-saving or for good looks (although it accomplishes both) – the aerodynamics of this model are much improved, saving fuel economy on those long highway miles that are part of rig life. 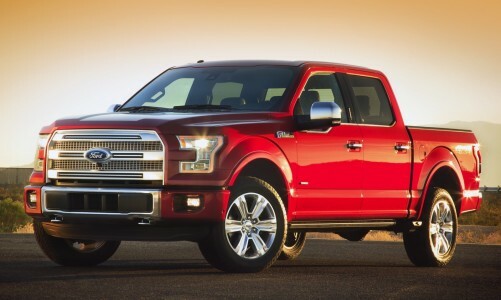 Ford offers a base V6, top-of-the-line V8, and two twin-turbocharged V6 engines in-between. The upper of those two provides 325hp and 375 lb-ft of torque, with a max towing rating of 8,500lb. The Ford Sync 3 infotainment system replaces the MyFord Touch, and other comfort features like a tailgate step (supports up to 500 lbs) and active driver assistance make this truck as much of a pleasure on the weekend as it is on the job site. 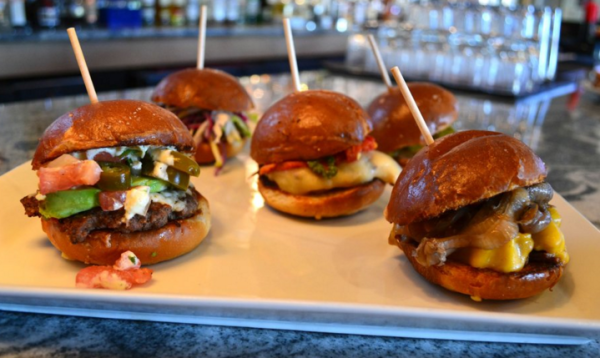 Countdown: 5 Best Restaurants – Midland! 5. 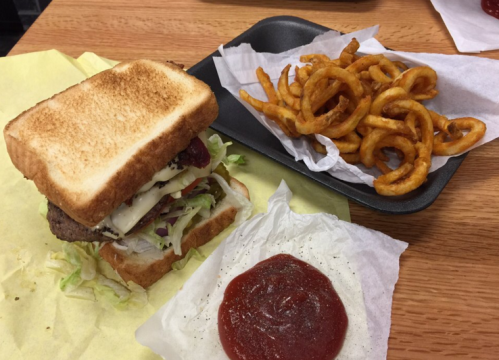 Basin Burger House – This Midland staple takes your average burger joint and kicks it up a notch! From the warm, inviting atmosphere to the fresh-cut fries and interesting burger combinations, this place does everything just a little bit better. They even offer some fare you won’t find at other burger bars, like “skinny fries” (green beans topped with grated parmesan) and a fully-stocked bar! The “Poblano Burger” with roasted green chiles, a fried egg, and avocado seems to be the house favorite! 4. 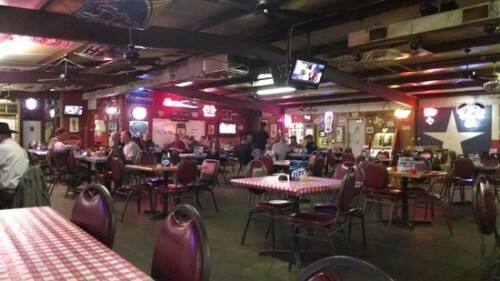 Hog Pit Pub & Grub – Sometimes you’ve got a craving for barbeque with a good old fashioned jukebox – and when you get that feeling in Midland, head over to Hog Pit. Regulars swear by the chicken fried steak and ribs (a half rack is plenty unless you’re seriously hungry) – but get your fill before the kitchen closes at 2pm! Don’t worry though, the bar stays open much later…and many nights you’ll find live music! 3. 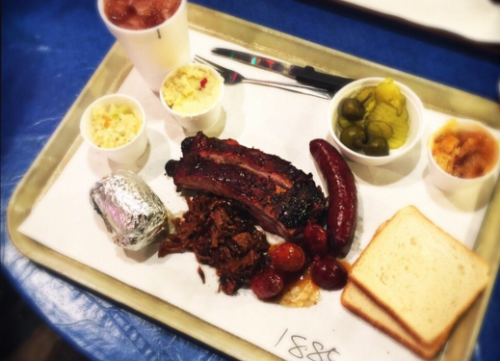 KD’s BBQ – This place has got to be the most popular barbeque restaurant in Midland, hands down – just walk right up to the giant smoker and point to what you want! The brisket is the house specialty, with a noticeable pink “smoke ring” bordered by a dark, crispy bark – the sausage has people talking, too. 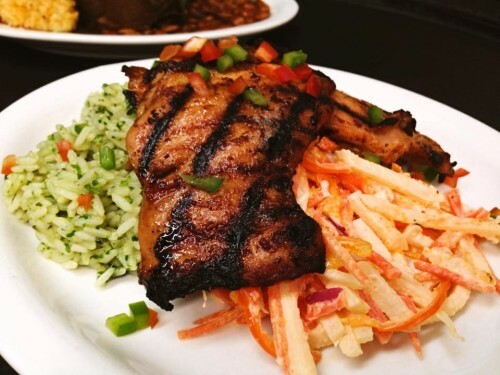 You pay for the meat by the pound, but the salad, beans and dessert are all included as part of the meal – you can’t beat that deal! 2. The Garlic Press – For business lunches or date nights, you may be looking for something a little more upscale – look no further than The Garlic Press in Wadley Heights. Every table is served the namesake appetizer – warm bread, butter, and a freshly roasted head of garlic with a garlic press – and it keeps people coming back! Take our advice and get a reservation if you’re going during peak hours. The wine list is extensive, the chefs and cuisine are outstanding, and the service is second-to-none. 1. Wall Street Bar & Grill – Every town has that place that seems to always be “happening” – if you’re in Midland place is Wall Street Bar & Grill. Two of the most talked-about menu items are their salad with house vinaigrette and crumbled bleu cheese, and the “gold brick” – ice cream with a signature chocolate hard topping! Oil folks come and go, but it doesn’t get much more quintessentially “Midland” than this place, right across from the post office. And that’s a wrap on Midland! While you’re checking out some of these places be sure and download Oil Patch Pro – we make navigating the oilfield simple, and put the information you need in the palm of your hand. Download it today for free for iPhone and Android! 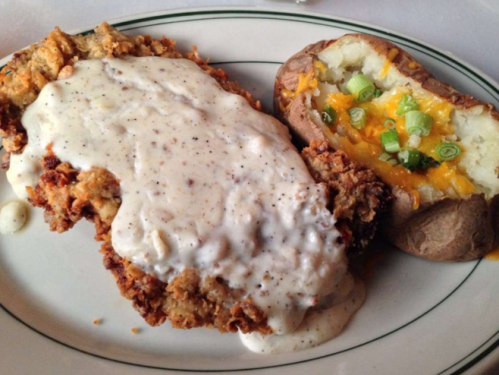 Countdown: 5 Best Restaurants in Odessa! 5. 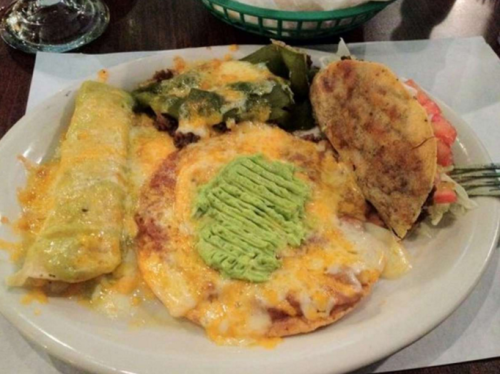 Jorge’s Mexican Food – This seems to be the go-to spot for a good burrito or some enchiladas…and people in Odessa know their Tex-Mex! Portions are big and the recipes are authentic. Here you can get all the staples – enchiladas, tacos, burritos, chile rellenos, and queso – at a great price! 4. 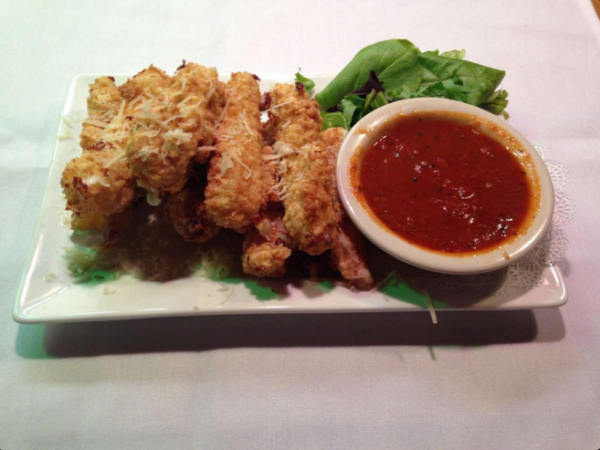 Zucchis Ristorante – Everything about this Italian joint is worth mentioning – but we’ll hit the highlights. Great pizza, great pasta, great steaks – you’ve gotta try the spaghetti bolognese. Larry the owner tries to greet each table and make sure they feel welcome, which is a really nice personal touch. The blackened chicken and tortellini is a local favorite – and their house salad dressing is to-die-for! 3. The Barn Door Steakhouse – This is the place to come if you’ve got that insatiable craving for meat! 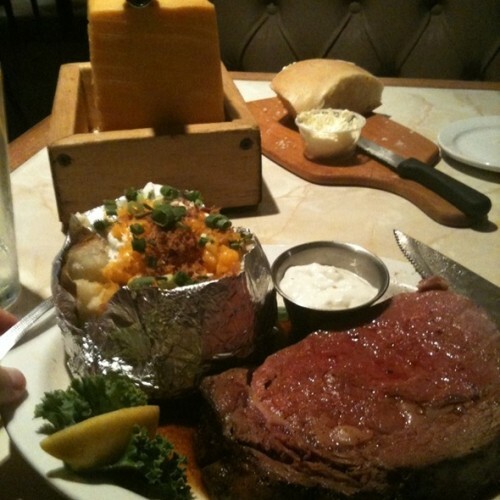 Their steaks are the best around, and the prime rib is famous throughout the Permian. Located across from Odessa College, the best part of dinner at The Barn Door is the complimentary house-made bread and 5-lb block of cheddar that is delivered to each table! That’s right – 5 pounds of cheddar cheese! That should hold you over while they prepare your steak and sides to perfection. Rumor even has it that there’s a chair set up for the resident ghost the “train depot” section of the restaurant…Insider info: Save room for the millionaire pie. 2. Dumplins y Amigos – Quick quiz: at which restaurant in the Permian basin you get steak, shrimp, nachos, stew, salad, enchiladas, and chile rellenos, and a cheeseburger all at the same meal? 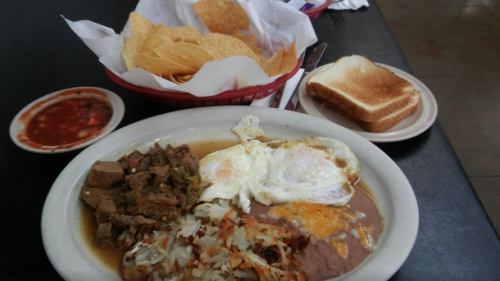 Dumplins y Amigos, of course – but people really come here for the breakfast! This mom and pop diner has been a part of Odessa for as long as anyone can remember, and the service is great – takes you back to a simpler time! The portions are a great size, and we heard from an insider that you’ve gotta try the Chile Verde Breakfast Plate. 1. Whitehouse Meat Market – This place may not be in Washington, but it’ll leave you feeling pretty Presidential! Originally opened in 1956, the spot boasts a full-service meat counter and butcher, but the famous cheeseburgers really put this place on the map – many say it’s the “best in town”! The menu is fairly simple, and the portions are large…you can even add flame-roasted hatch green chiles to your burger – a great touch! Pro tip: If you’re planning a cookout, let these guys do the hard work for you – they’ll put together meal packs for you to take and cook yourself! All in all, Odessa has some pretty great choices when it comes to satisfying your appetite. While you’re enjoying a meal at one of these great places, be sure to download Oil Patch Pro and use it to make sure you find the way back to your well site as easily and quickly as possible. 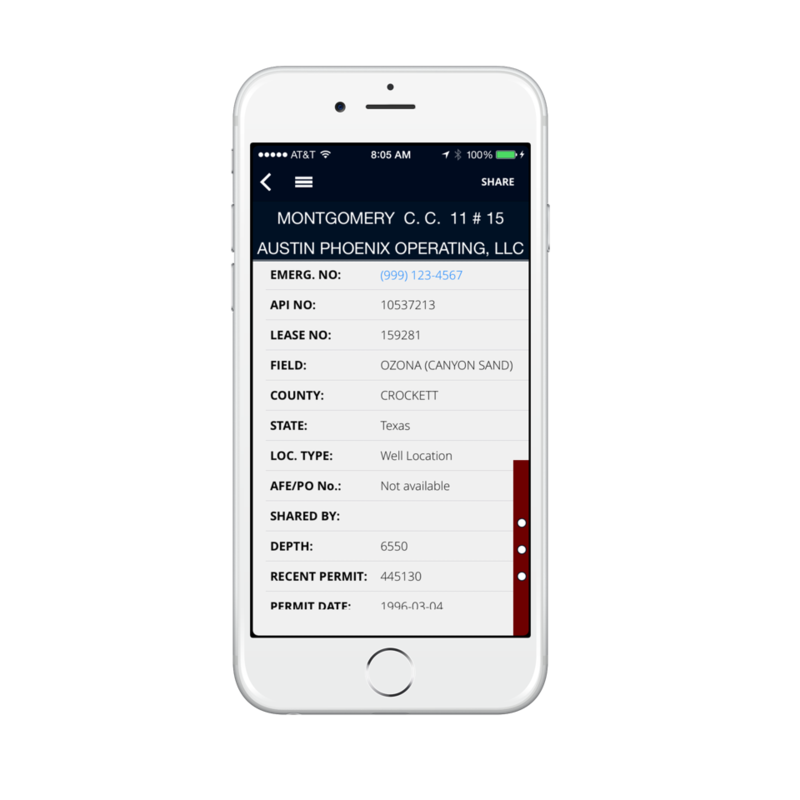 We take the guesswork out of directions and put the oilfield in the palm of your hand. Download it today on iPhone or Android. Be sure and leave us some comments on Facebook and let us know what your favorite restaurants are in our next spot, Midland! Call it what you want – digitization, modernization, “the great crew change” – every day we wake up to a new reality of life in the oilfield. In the next 5 to 7 years, 50% of the workforce is retiring. HALF. As they leave, they’re replaced at a rate of (again) 50% – that is, for every 2 retiring, 1 enters the workforce. And those to which they’re handing the reins? It’s a completely different group of people – predominantly under 35. Almost an entire generation. Sure, it’s an enormous task to continue operating at the same level when the industry is changing around us – and it’d be easy to get overwhelmed – but that’s what makes us (those still in the energy industry) different. We’re scrappy because we’ve had to be, we inherited this business at $40 per barrel. We know the realities of operational efficiencies and getting your hands dirty. We know that sometimes, even though it “ain’t broke” it could use fixing. There’s absolutely going to be an experience gap, but it’s being made up for with technology and new tools. Given the choice between budgets and efficiency in the form of technology adoption, we’re starting to see the dial move toward innovation! There’s an understanding that with relatively small money and time considerations, massive ROI can be uncovered. What used to take days and was a team effort, now takes one or two people a couple hours. The days of faxing hand-written directions to wells and three-ring binders packed full of shoddy vendor contact information are all but over. 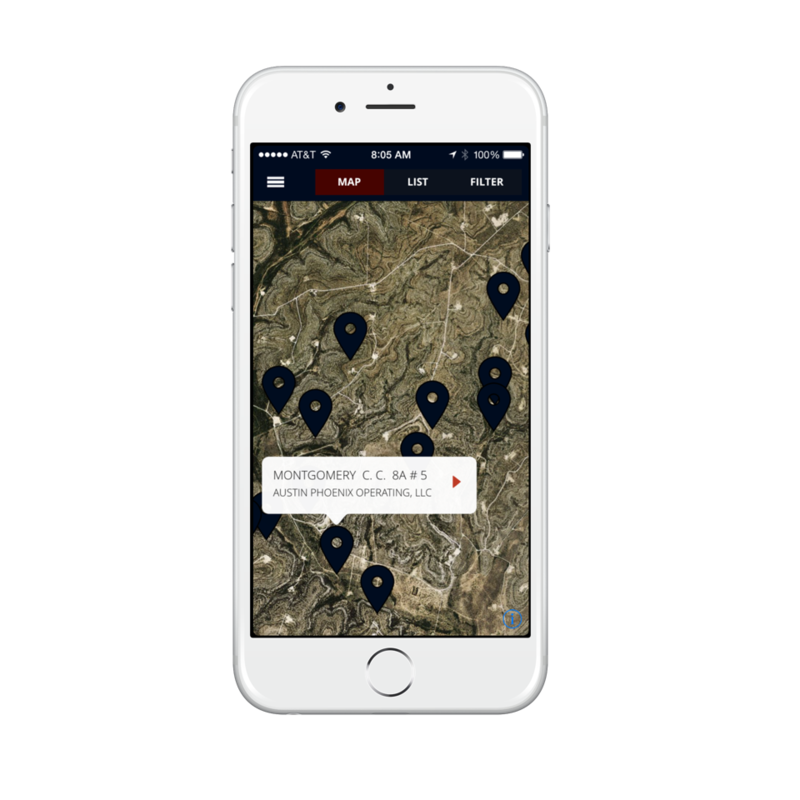 Oil Patch Pro, a cutting-edge oilfield navigation and location management platform for iOS, Android, and web has been instrumental in making this vision a reality. 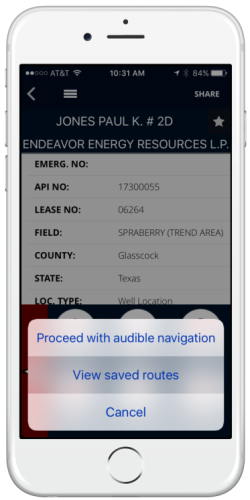 At its core, Oil Patch Pro is a mobile app allowing anyone in the oilfield to quickly access and share well data and live turn-by-turn directions to every active and permitted well location in Texas (more states coming soon!). OPP also offers a web app, giving oil and gas companies the power to set up critical well data and share it amongst company personnel, consultants, vendors, and service companies in the field. 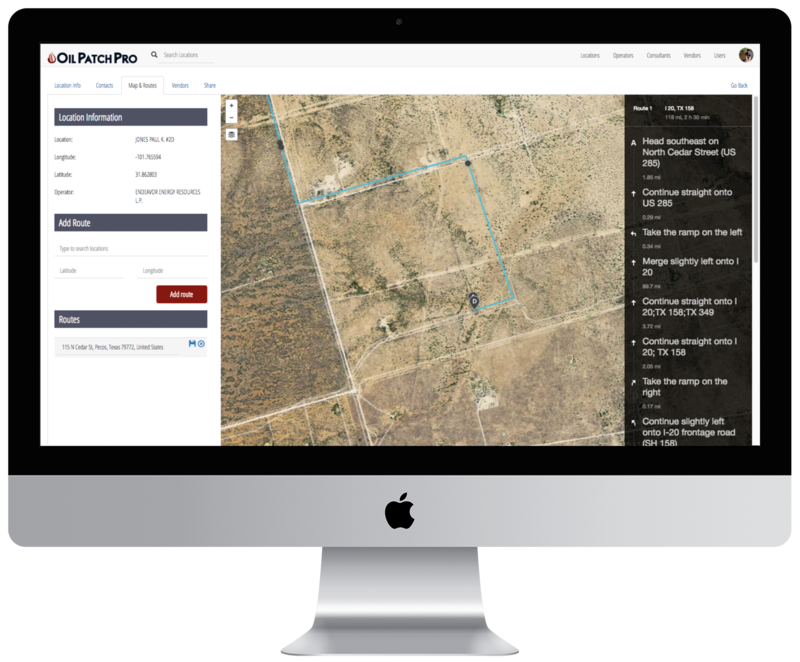 Easily increase operational efficiency by putting custom maps (for even the most remote locations), company man contact info, vendor lists, field notes, and wellbore design at the fingertips of those who need it most. See how it can make your life easier at www.oilpatchpro.com, and download it today on the App Store and Google Play. Remember the hot-shot driver that got lost, burning $1,000 per hour of your budget? Next time, have Oil Patch Pro in your front pocket and get that driver on site with ease. For us, getting back to $70 per barrel is not a question of if, but rather when. Will you be ready?